It seems that industry in Europe cannot count on the European Commission as far as co2 emissions are concerned. 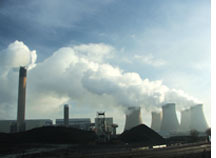 The commission has ruled that in 2008-2012, the next phase of the carbon trading scheme, the industry will have to emit 10 per cent less than what national governments had asked for. The commission fixed 2.1 billion tonnes of carbon quota for the 27-member bloc in the next phase of the scheme. National governments had asked for 2.3 billion tonnes. The decision came after the commission announced cuts in the carbon quota proposed by Bulgaria and Romania--the last eu nations whose co2 emission plans needed to be approved by the commission. A chaffed Bulgaria said that it could join Lithuania, Slovakia, Poland, Estonia, Hungary, the Czech Republic and Latvia, who are planning to take the commission to the European Court of Justice over reduced co 2 emission allowance (see 'Eastern Europe feels cheated on quotas', Down To Earth, September 15, 2007).